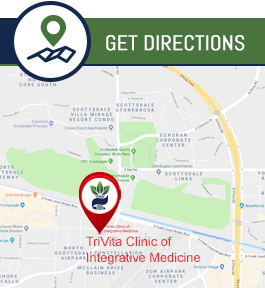 TriVita Clinic of Integrative Medicine Offers Women’s Health Services. Get Your Well Woman Exam at Our Clinic. We Are Located at 16100 North Greenway Hayden Loop, Suite G-100, Scottsdale, AZ 85260. Please Call at (480) 725-4474 or Request an Appointment Online. At TriVita Clinic of Integrative Medicine we provide whole person care. We empower our patients to make informed choices about their gynecologic care from adolescence to post- menopausal age. Integrative gynecology options include individualized treatments to meet your specific needs. We seek for the underlying causes of the problem, rather than simply identifying and treating the problem. We offer our patients the best of conventional and evidence based alternative and complimentary medical care. This approach offers women more choices for their gynecological care. At TriVita Clinic of Integrative Medicine, Dr. Chander & his expert team of medical professionals suggest making sure you take the time each year to receive a well woman exam, as it is an important step in taking control of your health. Your annual well woman exam will consist of a breast exam and a pelvic exam, and may also include a pap smear. Well woman exams can help to identify problems before they become more serious. Early detection for issues like cervical dysplasia and breast cancer can have an incredible impact on the effectiveness of available treatment. That is why it is so important to find a doctor with whom you can build a trusting and comfortable relationship. The next step of your breast exam includes palpation of each breast and physical examination of the breast and underarm area for any lumps. Your doctor may also take this time to show you how to perform a self-breast exam at home. Checking your breasts regularly can help to ensure that your doctor can be made aware of any irregularities as soon as possible, even if they appear between visits. Depending on your age or other risk factors, and whether your doctor finds any problems, you may also be referred to a specialist to have a mammogram performed.